Could Wall Street miss out on the biggest oil deal of all time? Saudi Arabia is considering where to sell shares in its mammoth oil company, Aramco, and New York, London and other international stock exchanges are still in the running. But speaking on a visit to London on Thursday, Saudi Arabia's top energy official made clear the kingdom has serious concerns about the risks it would run if it chose New York. 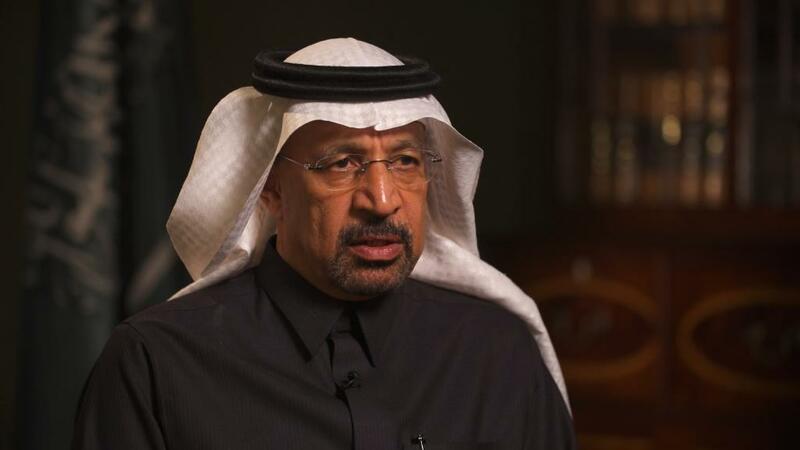 "I would say litigation and liability are a big concern in the US," energy minister Khalid Al Falih told CNNMoney's emerging markets editor John Defterios. "Quite frankly, Saudi Aramco is too big and too important for the kingdom to be subjected to that kind of risk." Al Falih made specific reference to New York City's decision to sue five big oil companies for the cost of protecting it from the "existential threat" of climate change. He called the allegations against the companies "frivolous." Saudi Arabia is planning to sell 5% of Aramco, the world's biggest oil producer, via an initial public offering. It has made all the preparations for the IPO to take place this year, although officials reportedly admit it could slip into 2019 to ensure the best conditions for the sale. Saudi officials have said that Aramco could be worth $2 trillion, more than six times the value of Exxon Mobil (XOM), although independent estimates are lower. Selling 5% of Aramco could raise $100 billion if the Saudi estimates prove to be accurate. A deal of that size would be an enormous prize for the world's leading stock markets, and they're lobbying fiercely for the business. In contrast to his cautious remarks about New York, Al Falih sounded upbeat about London. "The London Stock Exchange is one of the best in the world, it is well regulated and we respect it," the Saudi official said. "It has great many companies, including in the oil and gas sectors," he added. The IPO, which could be the world's biggest ever, is at the heart of the kingdom's plan to wean itself off oil. Proceeds from the sale will be pumped into other sectors, such as technology and tourism. It will also transform the Saudi stock exchange, the Tadawul, where Aramco will have its primary listing. Al Falih said the kingdom was waiting for the exchange to be granted emerging market status by index compiler MSCI before proceeding with the IPO. MSCI is due to carry out its review in June. "Aramco listing in Tadawul will be catalytic for that capital market, as we bring international capital to the kingdom," he said. "As for the announcement of the second listing, it will be made in due course ... but New York continues to be looked at, London continues to be looked at, other exchanges are being looked at."